TS Inter 1st Year Time Tables 2019: Telangana Junior Intermediate Public Exam Time Table March 2019 released at bie.telangana.gov.in, tsbie.cgg.gov.in. Students can Download Telangana Inter 1st Year Time Table/ TS Board Intermediate I Year Time Table From links given below. 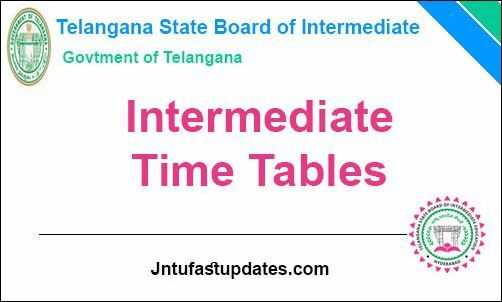 Telangana Intermediate First year Exam Time Table 2019: Telangana State Board Released the Examination Time Tables for Junior Intermediate and Senior Intermediate Students who are Studying in TS State For the Academic Year 2018-2019. Candidates those who are Interesting to Appear for TSBIE Exams of TS State can download the TS Inter 1st Year & 2nd Year Final Public Exam Time Tables From Below. Last Year, Telangana State Board of Intermediate Education 1st year exams started from 28th February and ends on March 17. The exams will be conducted from 9 am to 12 pm. In the month of March 2019, every year the Board of Intermediate Education conducts Intermediate 1st year IPE examinations and this year also TS Board of Intermediate Education is all set to conduct the Junior Inter exams in the same month 2019. Time table for the Telangana TS Junior Inter exam 2019 is available for all general, private, regular and vocational courses. Those Students who belonging to all the groups can get the schedule of their Inter 1st year exams 2019 that is BIPC, MPC, HSC etc can get their time tables from the official website which is given below. The board will conduct practical exams in 1 month prior to the main exams and the theory examinations are to be held with a minimum gap of two consecutive exams so that the students will get sufficient time for their preparation. The Telangana TS Board of Intermediate Education is decided to conduct Intermediate 1st year theory exams in the month of March 2019, if there is any other exams like government exams on the scheduled date the TS Board of Intermediate Education will organize the exams from March. Telangana State Board will Organize the TS Inter I Year Public Exams in the month of March every year. Students can write Regular and Supplementary Exams on these dates. Students can Download the TS Inter First Year Exam Time Tables 2019 From Below Official Website with the Date wise and Subject Name wise. Students are advised to pay the Exam Fee and Download the Telangana inter 1st year & 2nd year hall Tickets/ Admit cards in the Month of January for Public Exams. It is hereby informed that on December the Teangana State Board of Intermediate Education has announced the Intermediate Public Examinations, March 2019 (Theory) schedule to be started from February, 2019. Andhra Pradesh Board of Intermediate Education also announced its IPE March 2019 (Theory) schedule starting from 27-02-2019. 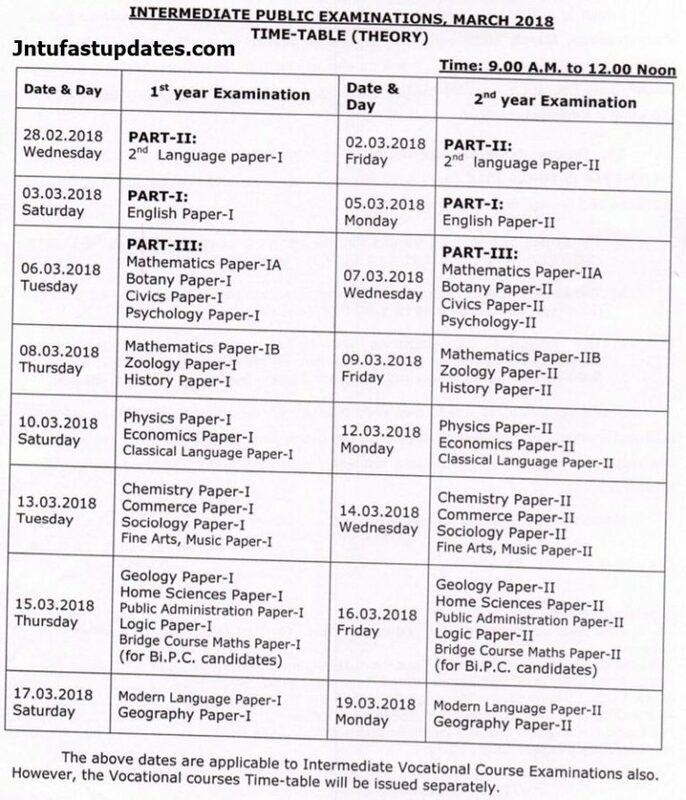 Keeping in view of the common syllabus in optional subjects in both Telangana and Andhra Pradesh states and as there is a possibility for sending the Question Paper of BIEAP through whatsApp that may create false rumours of leakage of Question Paper every day and panic / confusion in the students of Telangana state. In view of the above, to avoid imminent risk factors, the TSBIE has taken a decision to conduct IPE March 2019 on Same dates. b) Environmental Education Examination is proposed to be conducted on 30-01-2019 (Wednesday) from 10.00 A.M. to 1.00 P.M. as was done earlier. How To Download Telangana/TS Inter 1st Year Time Table 2019? Open bie.telangana.gov.in or click on Above Mentioned link. Open Telangana Inter/ Jr Inter Exam Time Table 2019 Link. Click On Download Time Tables. All the Best For TS Inter 1st Year Results 2019. 1.4 How To Download Telangana/TS Inter 1st Year Time Table 2019? 2018 March 1 st year students will be awarded with what ? Marks. Or grades ?